After an early alarm, we packed up our things and had a breakfast of croissants and fruit in the hostel. We headed to the Duomo metro station and got a coffee at the affordable and modern 12c coffee shop near the Duomo. As it was early, there was only a very small queue for the Duomo, and we got in with no issues. The Duomo of Milan is extremely beautiful and extremely worth the trip – the highlights being the large triptych of stained glass at the end, and the beautiful Madonnina of the Duomo del Milano in front of these. The Duomo del Milano is, most certainly, an extremely sacred, and beautiful place. Take your time walking around. And go early – there’s nothing like a tourist taking a selfie to ruin your peaceful mood. After the Duomo, we sat for lunch outside the Leanardo Da Vinci statue behind the Duomo and had a sandwich from Panini Durini (link to review coming soon) – spoiler alert: it was absolutely amazing. 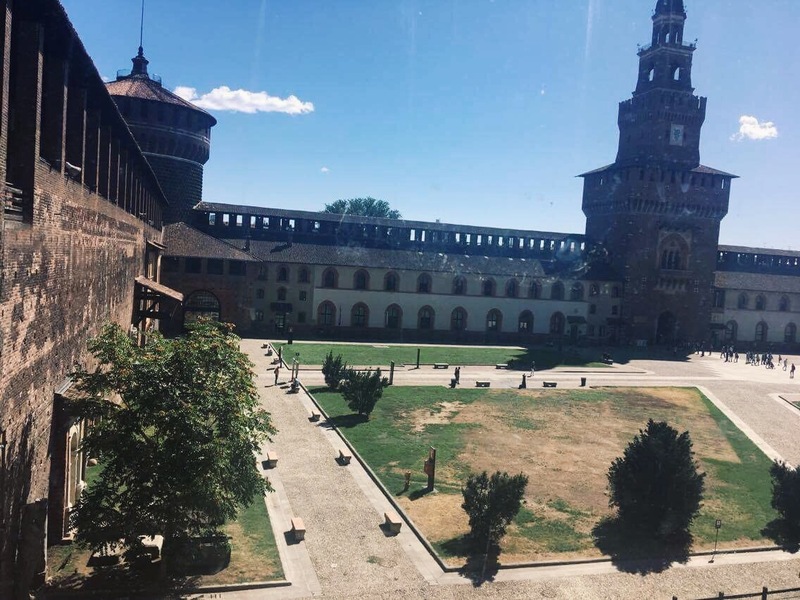 After lunch, we headed towards the Castello Sforzesco, a little further north than the Piazza di Duomo. Again, a ticket is only €3, and this gets you entrance to all of the museums inside the Castle. Entrance to the Castle grounds is free, so if you are really strapped for cash it is still worth going along to see the castle (the grounds of which are quite extensive). 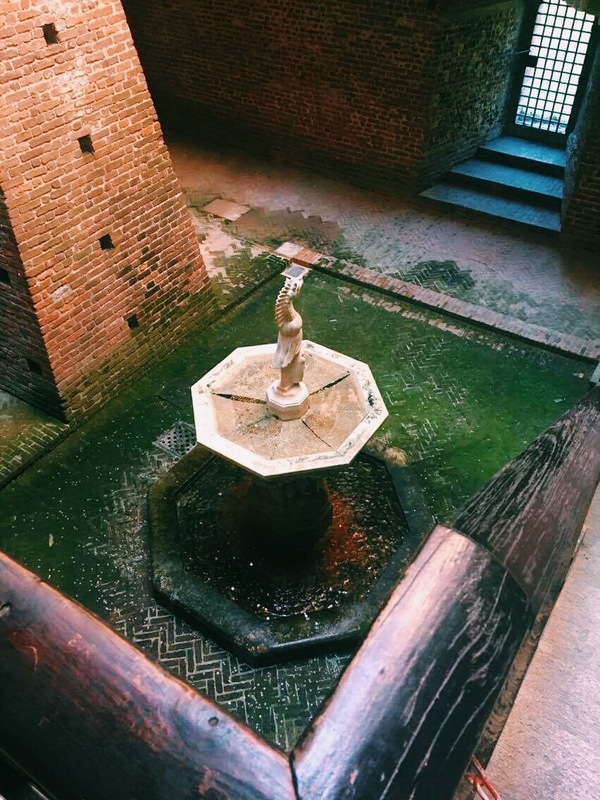 However, as this grants you entrance to six small museums, including an unfinished Michelangelo statue, an exhibition of musical instruments, and an exhibition of Leonardo Da Vinci’s work. Once we had gone around the museum and Castle grounds, we stopped outside for our last Gelato. As we were sitting down on a bench outside the Castle, a man approached us and asked us if we wanted a bracelet made of multicoloured string – we declined but he wouldn’t leave and tied it around my wrist. As he was tying it, he insisted it was free – however after he tied it he insisted that we pay him, and got a little aggressive when I refused to pay him (I said I didn’t want the bracelet, he tied on my wrist without my consent, I actually didn’t have any cash left). Eventually, we firmly told him to leave and he did – but those visiting the castle should be aware of this, as there are quite a few people wandering around attempting to sell these bracelets. Once we escaped the bracelet man, we headed back to the hostel to get out bags, and head to the airport. 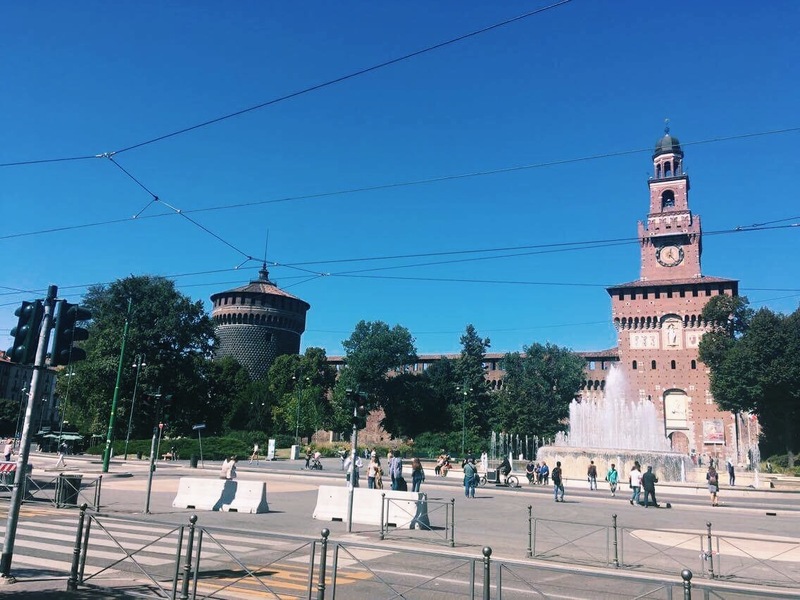 Overall, Milan is a beautiful city, busy enough to be exciting, but small enough to be perfect for a weekend trip. Flights are extremely cheap from London and Edinburgh, making it ideal for a spontaneous trip away!